Maybe you you’ve had Macaw! 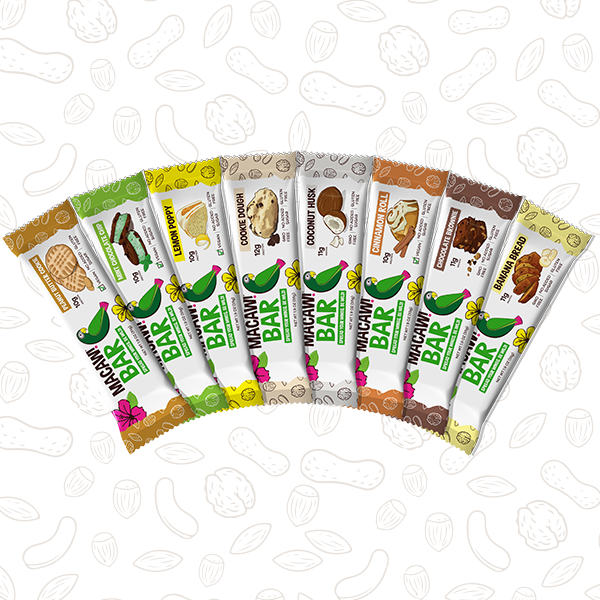 Bars before but you just can’t seem to figure out which one is your go-to favorite. This happens to us all the time around here at the Macaw! Foods facility. One week you can’t get enough Coconut Husk. It’s all you think about and crave throughout the day, and you can’t imagine life without Coconut Husk. But then all of a sudden, those same thoughts are transferred to Banana Bread! What the heck! If that sounds like your predicament, we definitely recommend going with a variety box. Variety boxes make a great gift option. If you plan on introducing Macaw! Bars to a friend or family member, it’s normal that you want to project your favorite flavor onto them and force them to like what you like, but why not allow them make that decision freely? With an assortment of fresh flavors to choose from, the person you care about can go through the same painstaking process of deciding on their own personal favorite. Maybe you’ve never had a Macaw! Bar and you’re wondering what these crazy things are all about! Getting acquainted through a variety box is the most practical approach. Some of our customers continue satisfying their Macaw! addiction through repeat orders of the assortment, or find solace in one particular flavor and stick with that. The choice is yours! Family can be difficult. Making every member of your family happy at the same time, can be really difficult! If you live amongst a household of picky eaters, a variety box of Macaw! Bars just might be your saving grace. Little Johnny can take Cookie Dough, Susy can have her Lemon Poppy, Dad can grab his Cinnamon Roll, and Mom can have whatever the hell she wants. Because, well, she’s mom. So there you have it folks. Regardless of your reason for not wanting a single flavor of Macaw! Bars, the variety box should solve most of your issues. Hunger issues, that is.